I'm turning into my mother. She used to "do things" with canned salmon. Namely a tasty but disturbingly cat-food textured dip served with Ritz crackers. I never have "done things" with canned salmon other than eating it on salads like tuna. In one of my ongoing battles with odd bits of leftovers and an overfull pantry, I came up with an elegant way to use leftover potatoes and canned wild salmon. Yep, I "did something" with canned salmon. The impetus consisted of three steamed russet potatoes that never quite made it into Susan’s birthday potato salad with the Yukons, because it hadn’t seemed quite right to mix them. Those potatoes had been taunting me from the vegetable drawer for a couple of days. Just daring me to use them. I kept thinking of eggs, and breakfast, and hash, but it just never happened. Suddenly it was Monday night and I was faced with a drawer full of fresh vegetables and a mean protein craving, with nary a speck of flesh defrosted. In a medium bowl, mash the potatoes with a potato masher until they are broken down, but with some texture remaining. Add the salmon, herbs, a small spoonful of mayonnaise, the harissa or other pepper, and salt and pepper. Mix and check for seasoning. Also check to see if the mixture holds together when you try to form it into a patty. If not, add a little more mayonnaise until it does. Form the mixture into 4 patties, dividing it evenly. Heat the oil in a cast iron pan over medium high heat until it is shimmering but not smoking. Carefully lower the patties into the pan. Cook on the first side until crisp and brown (2 to 3 minutes) Turn and cook the other side for an additional 2 to 3 minutes until brown. Serve immediately accompanied by seasonal vegetables. In this case it was steamed then sautéed broccoli with red pepper flakes and garlic, along with roasted golden beet and arugula salad. An unexpectedly great Monday night dinner, and easy too! 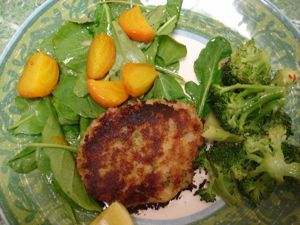 This entry was posted in food sustainability, healthy, seafood. Bookmark the permalink. Post a comment or leave a trackback: Trackback URL. Ummmmm! it is knew to me i wanna try this kind of cake,thank you so much for the ingredients love it. Will certainly visit your site more often now.